The Travis Country Commissioners Court has unanimously approved the master development plan for Thomas Ranch's Travis County portion. The 2,200-acre project will be the site for 3,300 new homes and apartments, as well as a marketplace, shops, entertainment venues, restaurants, a resort, hotel and spa, and other amenities. Situated on 1,676 acres in western Travis County and 546 acres in Burnet County's eastern portion, Thomas Ranch is one of the biggest proposed development projects in Central Texas in recent years. Dell today recognized 50 cities around the world for embracing technology to adapt and thrive in an ever-changing and globalized future. This ranking, the Dell Future- Ready Economies Model, scores large, high-growth global metropolitan areas based on attributes that enable people and organizations to access new tools and new ideas that deliver better connectivity, better economic performance – and a greater ability to attract talent. By examining the attributes of these communities, Dell can help the public, as well as private organizations, become more Future Ready by identifying policies and technology strategies that will foster growth. Austin is a thriving city with a truly growing economy, but there are just some sectors that cannot grow as well as the others. While industries such as technology and finance are booming in the Texas capital, we can't say that home-flipping is faring just as well in Austin. 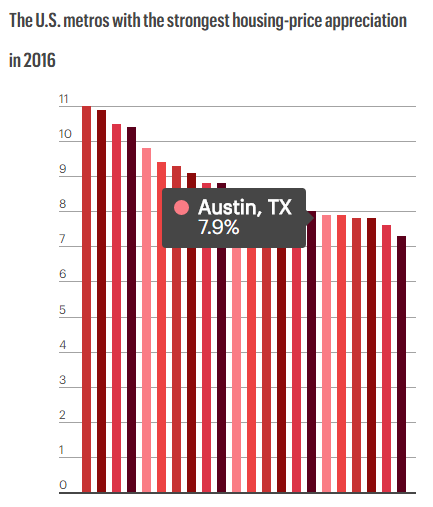 Austin is among the list of cities where house-flipping rates are at the lowest (3.4%). This is primarily caused by a booming residential real estate market and extremely low inventory levels.